Posted on February 11, 2013 by Susan H.
Valentine’s Day is only a few days away…time to bake something special for all my boys. 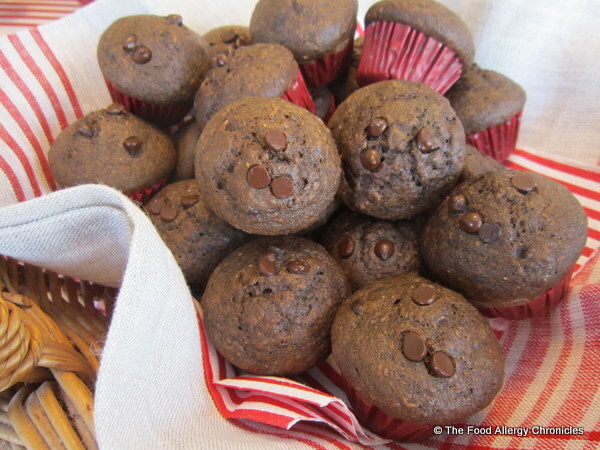 How about a basket of freshly baked allergy friendly muffins to start the day? Mmmmm…these little treasures were a hit! Matthew loved this mini muffin version. He literally kept popping them in his mouth…I lost track as to how many he ended up eating. Very addictive! Andy was also quite taken by the mini muffins…as was Michael. You won’t believe where I found the recipe…in the 2012 Milk Calendar! Click here for the original recipe. Baking with milk may be easy…but when you have a dairy allergy, it is down right lethal! Substituting for the milk and melted butter in a muffin recipe is simple…just replace the milk with either Natur-a Soy Beverage or Natur-a Rice Beverage and the melted butter with canola oil. I also replaced the one egg with 2 tbsp of water and 1/2 tsp baking soda. The orange juice was replaced with coffee…Matthew was not keen on the idea of orange in his chocolate muffin. As he likes the flavour of coffee…it seemed like a good substitution. Unfortunately, the coffee flavour did not come through…next time I would use a stronger coffee…Espresso. I love that this recipe’s flour base is half wholewheat flour…the boys didn’t even seem to notice the extra built in fibre. An added bonus! 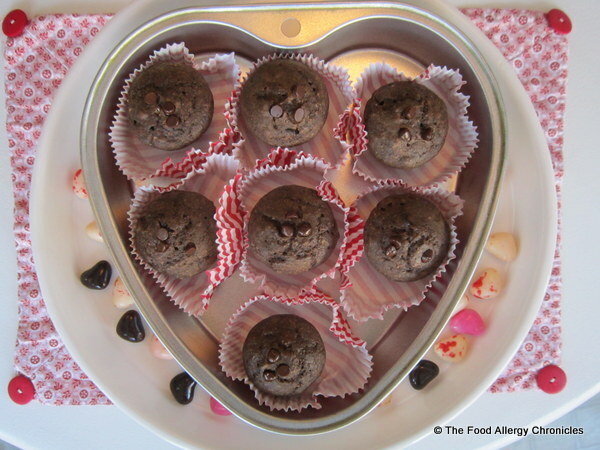 …Dairy, Egg, Soy and Peanut/Tree Nut Free Chocolate, Chocolate Chip Mini Muffins are all dressed up for Valentine’s Day. Mini muffins are hard to resist! 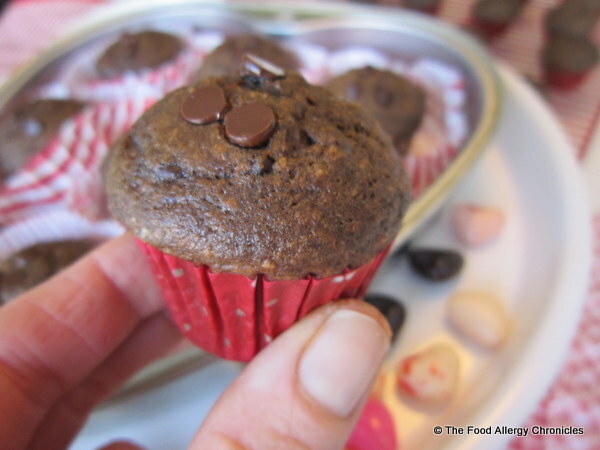 Are you planning on baking any allergy friendly Valentine treats for your family? This entry was posted in allergies, baking, dairy free, egg free, muffins, multiple food allergies, peanut/tree nut free, soy free, Valentines and tagged 2012 Milk Calendar's Dark Chocolate Orange Mini Muffins adapted to be dairy and egg free, Chocolate Chip Mini Muffins, Dairy Egg Soy and Peanut/Tree Nut Free Chocolate, Natur-a Rice Beverage, Natur-a Soy Beverage by Susan H.. Bookmark the permalink. I’d take out the orange too! I don’t like that combo. I don’t do well with coffee and caffeine, though, so I’d have to substitute something for that….hmm…..
Great idea!!! Thanks for the suggestion. I LOVE chocolate, so I’m definitely gonna have to try this! These look tasty! Thanks for the recipe 🙂 Enjoy your allergen free Valentines Day! Yum!!!! If you use coffee you need to double brew it at double strength… Then you’ll taste it!